During the Second World War several small fortified towers were built in the estuaries of Thames and Mersey rivers, England. 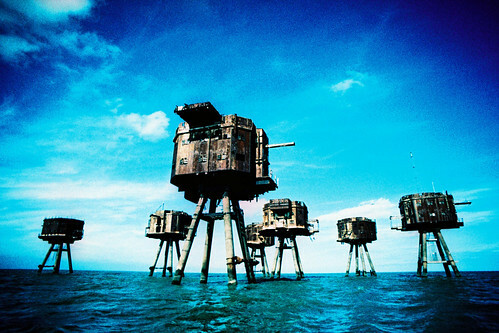 These mini forts were part of Defence of Britain and were called 'Maunsell Sea Forts' after their designer Guy Maunsell. 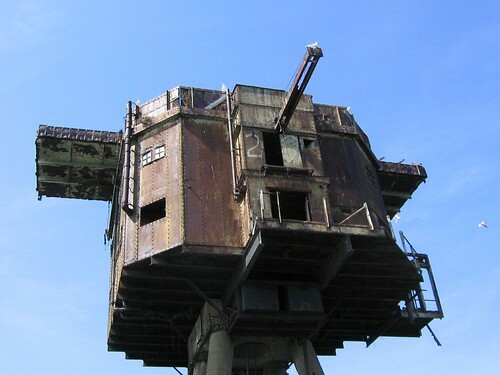 Seven such towers were installed in Shivering Sands area of the Thames estuary and these were interconnected by steel platforms, five carried anti-aircraft guns arranged in a semicircle around the control centre and accommodation tower while the seventh, set further out than the gun towers was searchlight tower. A total of 300 military personnel lived and worked in these towers. 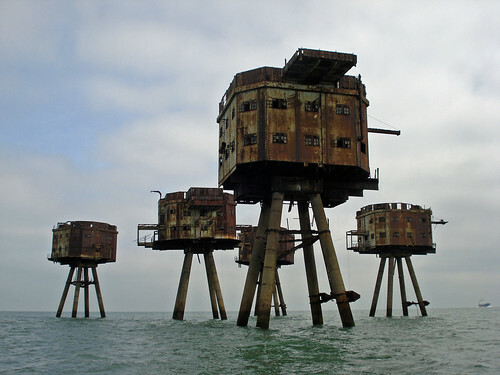 The towers were built on land and floated out in 1943. The forts were abandoned in 1958. In 1964 a pirate radio station was installed on one of the old towers which was later expanded under the name of Radio City and used all the five towers that were still connected. However the project didn't last very long and the towers were again abandoned and are now decaying away. Although from a distance these like some robotic creatures of Star War, these are today a grim reminder to the deadliest conflict in human history with over seventy million casualties. Being very small these are not visible in Google Earth. However I am showing approximate location of these in the sea.